Wilma Price was walking out of a Walmart in Huntsville, Texas, when she spotted a homeless man holding a cardboard sign with an unusual request written in bold black marker. Those five words caught Price’s attention. As a dog lover, she could feel the desperation in the man’s eyes as he stood by the exit, begging for spare change. With only $8 in her pocket, Price kept walking. But before she was even halfway to her car she circled back. She asked the man, who she later found out was named Patrick, to explain what happened. That broke Patrick’s heart. 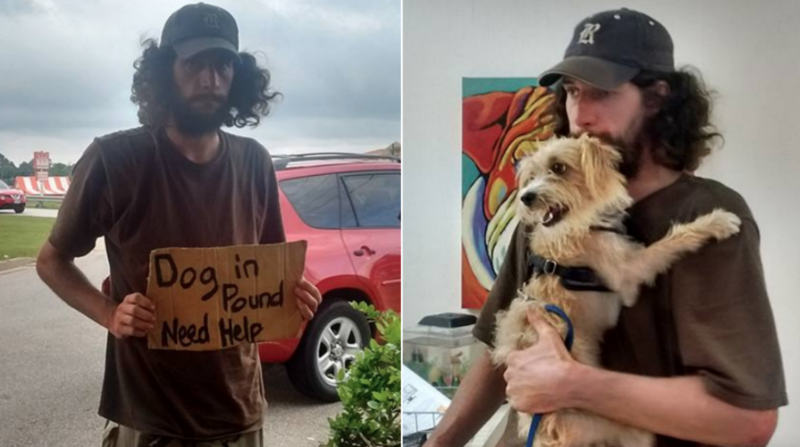 When he was released from jail, he inquired as to how he could get his dog back. When he contacted the shelter, they told him it would cost $120 — $10 for each day the animal was there, plus the cost of updated vaccinations. “I’m not leaving this town until I get my dog,” Patrick told Price. Inspired by the man’s love for his dog, Price decided to help. After calling up a friend for help with the funds, the pair had enough money to get Patrick’s dog back. Before giving him a lift to the shelter, Price made sure he had everything necessary to care for the animal. He did. A water bowl hung from the side of Patrick’s backpack, which was filled with a small package of dog food and toys. Within two hours after their chance meeting, Patrick was reunited with his scruffy tan pup. His eyes filled with tears as Franklin jumped into his arms, tail wagging. By the end of the happy reunion, everyone was in tears. “I’m always for the underdog,” Price said. Since that day, Price has formed a friendship with Patrick, and her good deed has gone viral. She even set up a GoFundMe page to help the pair on their journey. More than $7,500 has been already been raised since the charity page went live five days ago.